One of the first things people notice about you is your smile. If you are self-conscious of your smile and unhappy with the alignment of your teeth, Invisalign may be an option to give you the straight, beautiful smile you deserve. Invisalign is an orthodontic treatment that doesn’t require wearing braces. Most adults prefer to use Invisalign as a way to straighten teeth as it has barely any impact on your lifestyle and confidence. Invisalign consists of wearing a set of virtually invisible, custom-made aligners. 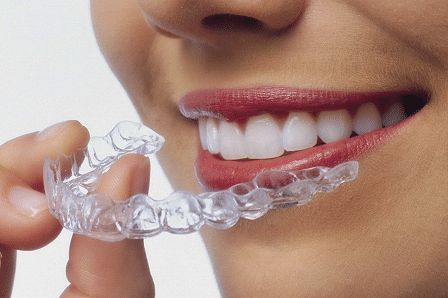 The aligners are computer generated from a mould of the patient’s teeth and the fitting is unique to each patient. They are made of thermoplastic material and look very similar to teeth-whitening trays. The aligners are changed roughly every two weeks for a period of six to eighteen months, or longer depending on the severity of misalignment. Unlike conventional braces, Invisalign is one of the most convenient methods to straighten teeth, requiring patients to make minor life changes to accommodate the orthodontic treatment. The aligners can be removed for brushing, flossing, eating and drinking- unlike braces that not only complicate oral care but also are especially prone to damage when eating hard or chewy food. Because the aligners are transparent, patients using Invisalign can straighten their teeth without embarrassing metal brackets and wires covering the natural look of their smile. The plastic aligners are also gentle on cheeks and gums. Braces, being metal, can have sharp edges that can sometimes hurt the inside of the mouth. Crowded teeth – overlapping teeth and teeth that seem to be pushing others into incorrect position. Overbites – when your top teeth sick out too far over your lower teeth. Not everyone is a good candidate for Invisalign treatment. There are some orthodontic cases which Invisalign is not the best treatment option. For example, Invisalign is not appropriate in cases of severe overbite. A more advanced orthodontic treatment may be required to correct the condition if it is the result of a skeletally based malocclusion. Invisalign cannot be used to treat a tooth that is tipped more than 45 degrees from normal position or rotated more than 20 degrees from a normal position. Invisalign should also not be used in children or young teens whose teeth and bite are still developing. Metal braces are the preferred treatment method for young patients. Patients must be committed to following all of the Invisalign treatment guidelines. One of the advantages of Invisalign is that the clear aligners are removable for eating, drinking and oral hygiene. However, if they are not replaced immediately after and worn for the required 22 hours per day, the treatment may not be effective and can take longer than anticipated. To know if Invisalign Treatment is right for you, schedule a consultation with the team at Pimpama City Dental Centre. You could be closer than you think to a beautiful, straight smile!